HOWDY! It's that time of year again! 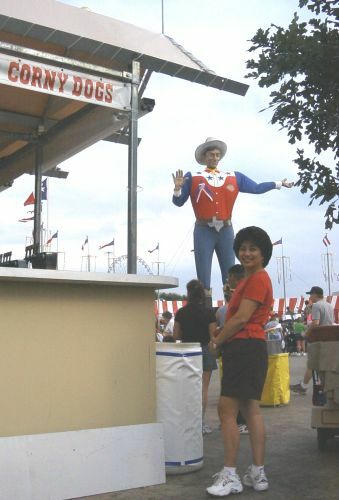 Big Tex seems to be inviting Angie to enjoy a Fletcher's Corny Dog at the State Fair of Texas, 2001. We made it down Wednesday afternoon and looked the place over. Got our fill of corny dogs, turkey legs, beer and fun. Once Angie gets her corny dog, all is right in the world. 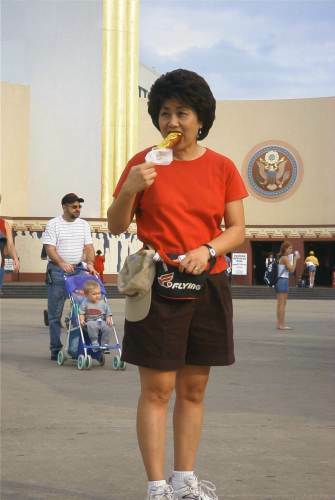 Folks, this is the reason they invented mustard! 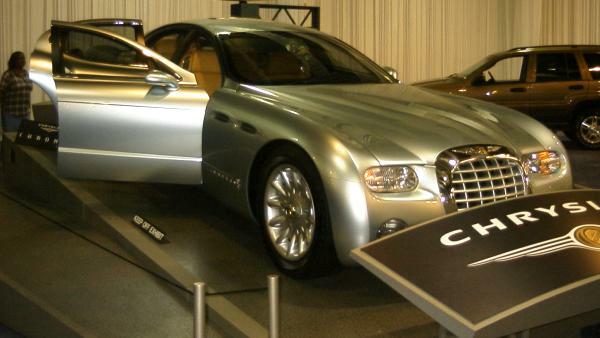 Chrysler's "concept" car caught our eye this year. Looks sleek enough to be the Bat mobile. 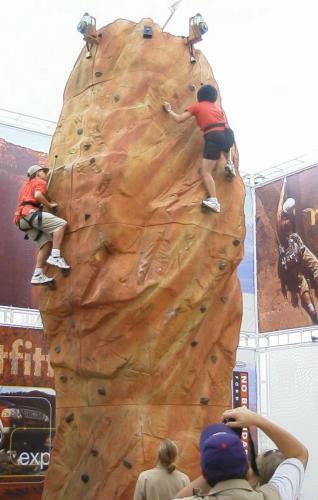 Angie decided she just had to try out the "rock climbing" at the Ford exhibit. Then the young man on the left challenged her to a race to the top. She managed to get up there and ring that cowbell before he even got close! 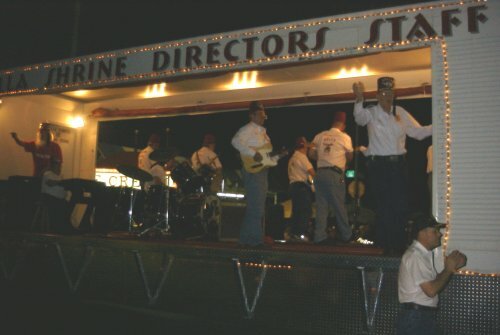 The parade seemed unusual in that the US Marine Corp Band didn't lead it, but, as always, the Hella Shrine Texas swing band finished it up and put everybody in a good mood. 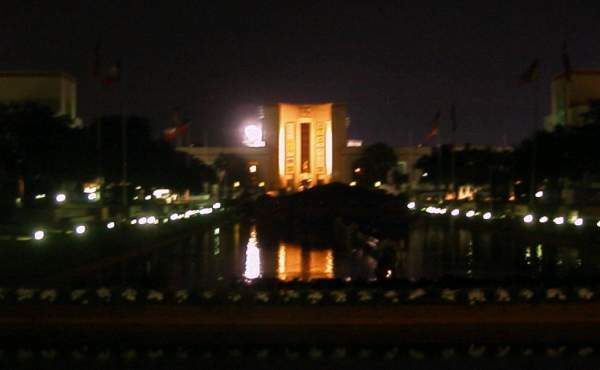 I just had to try and get a night time picture of the Hall of State all lit up. Looks like I really need to get me a tripod! The hit of the Fair for us was "The White House in Miniature". It's over 60 ft long, and unbelievably detailed. 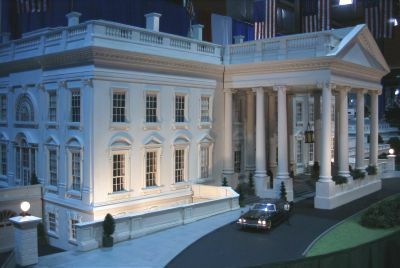 The entrance to the miniature White House featured the presidential limousine, complete with lit headlights.